Work, a former Marine, earned his Bachelor's degree from UIUC. WASHINGTON, April 30, 2014 – By voice vote late today, the Senate confirmed Robert O. Work, a retired Marine Corps colonel, to be the next deputy secretary of defense. Christine H. Fox has been acting deputy secretary since former Deputy Defense Secretary Ash Carter stepped down in December. In a statement issued shortly after the Senate vote, Defense Secretary Chuck Hagel said he welcomes Work’s confirmation. Work stepped down as undersecretary of the Navy in March 2013. Since then, he has headed the Center for a New American Security in Washington. A distinguished graduate of the Naval ROTC program at the University of Illinois, Work was commissioned as a second lieutenant in the Marine Corps in August 1974. During his 27-year career, he held a wide range of command, leadership and management positions. He commanded an artillery battery and artillery battalion, and was the base commander at Camp Fuji, Japan. His last assignment in uniform was as military assistant and senior aide to Navy Secretary Richard J. Danzig. After retiring from the Marine Corps in 2001, Work joined the Center for Strategic and Budgetary Assessments, first as the senior fellow for maritime affairs, and later as the vice president for strategic studies. In these positions, he focused on defense strategy and programs, revolutions in war, Defense Department transformation and maritime affairs. Work also was an adjunct professor at George Washington University, where he taught defense analysis and roles and missions of the armed forces. In late 2008, he served on President Barack Obama’s DOD Defense Transition Team. 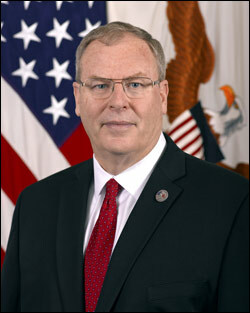 In this role, he led the Navy Department issue team, and he served on the defense policy, acquisition and budget teams. Work earned a bachelor of science degree in biology from the University of Illinois and master of science degrees in systems management from the University of Southern California, in space system operations from the Naval Postgraduate School, and in international public policy from the Johns Hopkins School of Advanced International Studies.